Good craft beer abounds in Portsmouth, New Hampshire, and Kittery, Maine, right across the Piscataqua River. New England is nothing if not charming, and Portsmouth, New Hampshire, and Kittery, Maine, right across the Piscataqua River, can feel like the pinnacle of quaint New England charms. Brick abounds, bookstores and small shops and local restaurants are bustling, and the picturesque provides a pretty backdrop. And there is, of course, good craft beer. Much like seemingly every city in the country, the area is becoming denser with breweries and beer bars, so here are a few new ones to check off on a day trip. Start in in Kittery, at Tributary Brewing Company (10 Shapleigh Rd. ), opened by former Portsmouth Brewery Head Brewer Tod Mott and his wife Galen Mott this past September. On tap: a winter saison, milk stout, the last pour of a porter before being replaced with a black IPA, and a pale ale, available for tasting and in larger pours and growlers. The bright blue and spacious taproom includes seating at the bar, picnic tables, and a few armchairs (one of which was occupied by a friendly pup). A short drive away in downtown Kittery, the Black Birch (2 Government St.) draws beer-, cocktail-, and food-lovers from all over Maine with its emphasis on simple, well-executed food often sourced from Maine farms. The beer selection also highlights Maine and New Hampshire breweries such as Oxbow, Allagash, and their neighbor, Tributary. Pair a pint with their famed deviled eggs, three ways. The first stop across the bridge in Portsmouth is Earth Eagle Brewings (165 High St.). The cozy brewery (pictured at top) tucked away in downtown Portsmouth has carved out a niche with gruits: herbal ales brewed with little or no hops. While they do have an IPA on draft—Ancestral IPA brewed with Cascade, Centennial, and Columbus in the boil and dry-hopped with Simcoe—other herbal blends are highlighted here. A rose-hip saison, Angelica Rosa brewed with French yeast and angelica root, is a lovely sipper while Exhilaration, a tart gruit brewed with heather flowers, Labrador tea, and sweet gale could easily convert any sour skeptics. Hearty food, such as an award-winning meat chili and a manchego and date sandwich, makes Earth Eagle a perfect lunch spot, too. Find great day trips and beercations in every issue of Craft Beer & Brewing Magazine®. Subscribe today! There’s no shortage of places in Portsmouth to stop for a pint, either. Try The Press Room (77 Daniel St.), a locals’ hangout with a laidback but polished vibe, Coat of Arms Pub (174 Fleet St.) for a comfortable English pub, or WHYM Craft Beer Cafe (3548 Lafeyette St.), a stellar beer bar a little further out of downtown. And, of course, no Portsmouth pub crawl is done until you’ve paid a visit to The Portsmouth Brewery (56 Market St.), where you can try their lineup on draft or buy a growler or bottles to go and grab a bite to eat. About 20 minutes south of Portsmouth, at Smuttynose Brewing Co. (105 Towle Farm Rd. 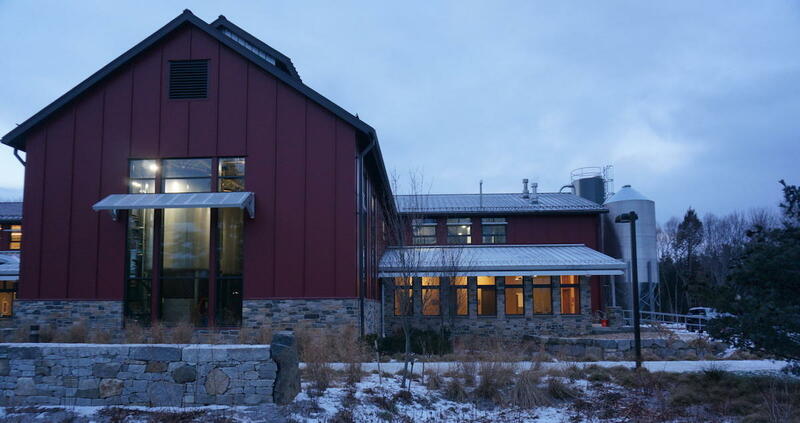 ), you can tour Smuttynose’s beautiful, energy-efficient new brewery (pictured below), opened to the public last spring on the sprawling grounds of Towle Farm. The tasting bar features Smutty favorites such as Finest Kind IPA alongside newer releases, such as Durty, their hoppy brown ale. Soon, you’ll also be able to sit down for lunch at Hayseed, Smuttynose’s farmstyle restaurant in a converted Victorian-era farmhouse, as it’s scheduled to open in February. Expect more than two dozen beers on draft, cask ales, a seasonal outdoor beer garden, and rare beers from Smuttynose and Smuttlab, their more experimental line. These rustic, craft-beer destination spots are tucked away in high country, and they’ll be the perfect way to top off a day on the slopes.